The first glaring irregularity in Shishakli's speech was that he was never elected. Far from being committed to any democratic process or republican principles, he actually undermined it. 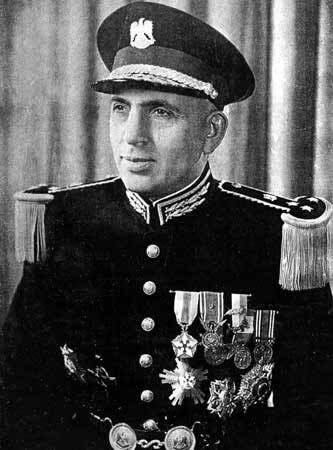 Shishakli was involved in three coup's and had helped General Husni al Zaim overturn Syria's nascent (and bumbling) parliamentary democracy - albeit dominated by the landowning aristocracy - in Syria's first coup. He then helped Sami al Hinawi take power in a second coup, before turning on Hinawi and making himself the de facto ruler of Syria, placing his friend Fawzi Selu as a figurehead. He did eventually become president but that only lasted for about a year, after which he was ousted by enormous pressure. There are, it could be argued, some parallels with the political career of Hafez Assad, but I think that the similarity is superficial. He was a central figure in ousting his former comrad Husni al Zaim, and was furious that Zaim had handed over Antun Saadeh, the founder and head of the Syrian Social Nationalist Party (SSNP) over to Lebanon, where he was later tried and executed. Shishakli had become enamoured with the ideas of the SSNP (a quasi-fascist super nationalist Syrian ideology)during the 1948 war against the Israelis. During Shishakli's rule political opponents were exiled, assassinated or imprisoned. Political parties were banned, and during his time political heavyweights such as Akram Hawrani, Michel Aflaq and Salah al Din Bitar, were all exiled to Lebanon, where they continued working against him. It is strange to read of the Baath party as being a marginalised and repressed political party, but during the fifties that is precisely what they were. As an exception to most of Syria's presidents before or since, Shishakli was quite the public orator and it is said that he used to address the Syrian people by radio almost every single day. His rule was said to be progressive, and women were encouraged to take part in public life and the armed forces. Coming from a notable Kurdish family from Hama, Shishakli seems to be a figure that somebody wants to whitewash. The Wikipedia entries about the man are quite sympathetic, although the Arabic version is horribly biased and very badly written; it portrays his period of rule as some kind of golden age. He is said to have described himself as the "Caesar of Syria" and if true then this would be quite apt given his involvement with the SSNP and support for the fascist ideas of Antun Saadeh. Although from a minority background, Shishakli was merciless in his dealings with the Druze of Suweida, and in an infamous act that was unprecedented in the short history of the new Syrian republic, he ordered the Syrian army and airforce to carry out a campaign against them. There are no exact figures as to the number of casualties suffered, but the campaign was deeply shocking to many Syrians, who had come to expect such behaviour from the French, but certainly not from their own countrymen. In a sense, the iron-fisted policy he applied to the Druze would ultimately be his downfall. In a small Brazilian town in 1964, ten years after he wrote this resignation letter, a young Druze man by the name of Nawaf Ghazaleh stopped him as he walked over a bridge, exchanged a few words, and then shot him five times. Ghazaleh had gone all the way to Brazil to exact revenge on the man who had carried out the first massacre of Syrian civilians in the history of the Syrian Arab Republic. It is ironic and tragic that today people are quoting Shishakli with nostalgia, after forty years of Baath party rule and thirty years of Assad family rule.